Her diagnoses should be annulled and the people who have successfully abducted babies through her misdiagnosis should be informed. I’ve witnessed the corruption in family courts and have experienced first hand the traumatic effects that this can have on children and their families. Francis Sanchez: It is pretty sad when individuals in control abuse the power they are given. The victims that they hurt are the powerless and they are afraid to tell their stories. Lets continue to be the voice of these victims and erase abuse of innocent victims. 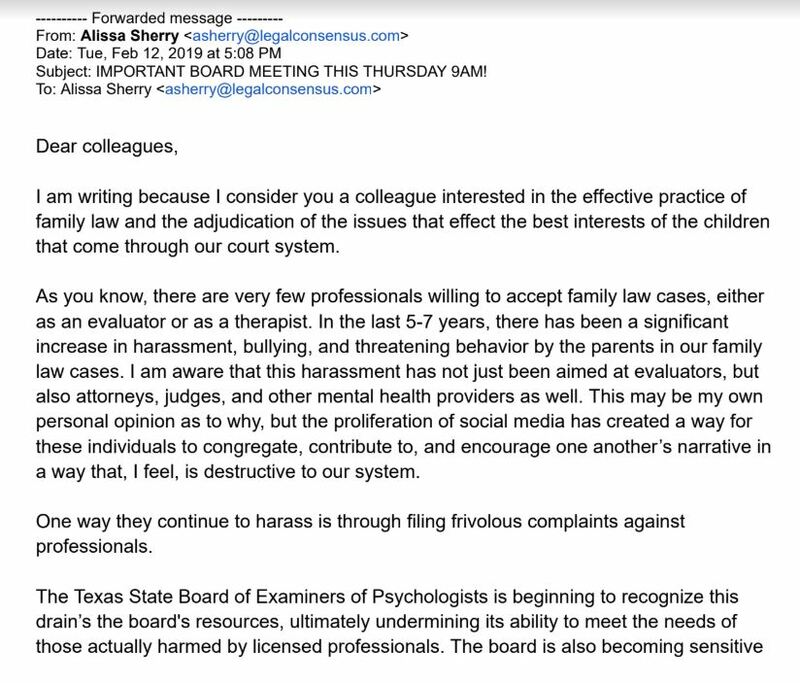 The Texas State Board of Examiners of Psychologists had its quarterly Board Meeting in which there was standing room only and overflow into the hallway. Twenty-six (26) non-professionals signed up to testify or provide written statements. 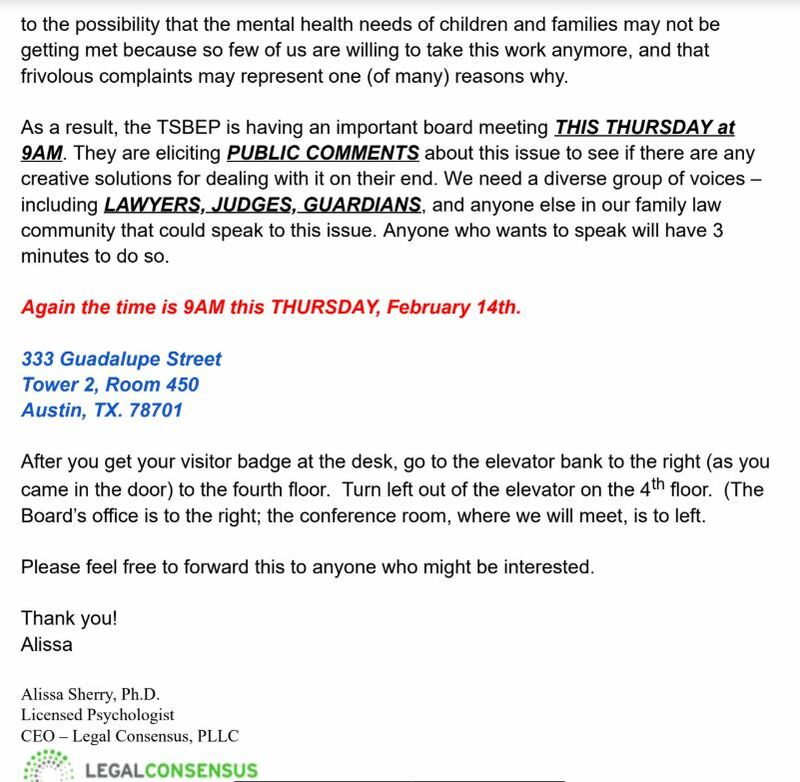 The primary public interest at the meeting involved debates focused on the role of Forensic Evaluators who are licensed by the TSBEP in family court litigation. Prior to addressing the Board, individuals were required to sign in with their full name and signature. After signing in, each speaker was allocated 3 minutes to speak. The 3-minute time limit was enforced until Dr. Sherry spoke. Instead of enforcing the 3-minute rule, the Board allowed her to speak for 11 uninterrupted minutes. Of the non-professionals in attendance, all 12 of the individuals who testified against immunity for Dr. Sherry were required to sign in before being allowed to speak while the only individual to speak in support of Dr. Sherry was allowed to testify without signing in and without providing a last name. The optics of favorable treatment to former board member Dr. Alissa Sherry are disturbing as the Board has summarily dismissed the last five complaints filed against her. Open forum meetings are essential for the public to maintain faith in their governing bodies and all participants should be treated equally.